Sometimes I have a hard time trying to vary our daily activities. Now, toddlers crave some routine, but the exact same thing every single day and well, this momma starts to go crazy. Right now, we are a one-car family, which my husband takes to work or the Army pretty much every day. So, I’m stuck at home with Little Monkey. Just under 1000 square feet can feel like 3 square feet when trying to entertain a rambunctious (almost) 2 year-old day in and day out. I kept seeing good ideas in magazines and blogs and other sites, but when it came down to crunch time and Little Monkey was ornery and bored, and I’m frustrated from listening to the whining, I’d crumble and turn on Mickey Mouse Clubhouse or Cars or whatever. Just for a little peace and quiet. I didn’t like us watching that much TV though. 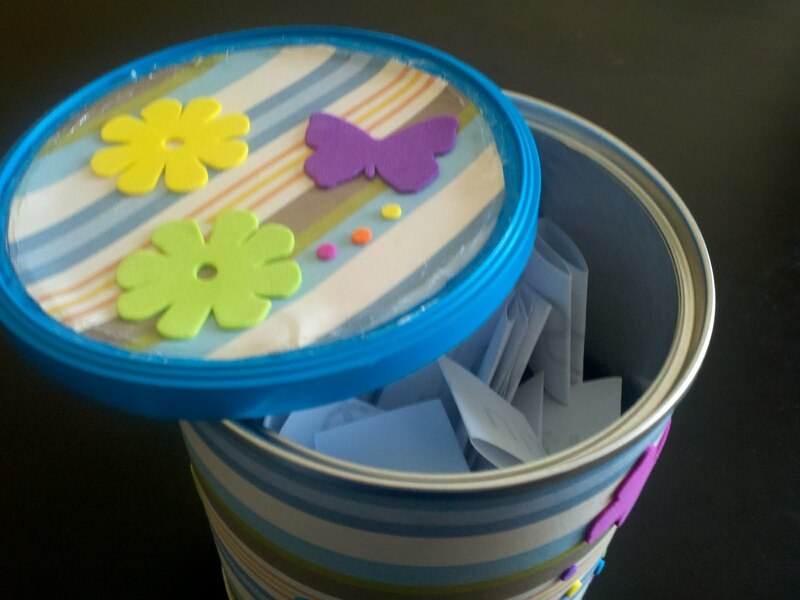 (And you can only watch the same four shows so many times…) So, I created the Boredom Buster Jar. 1) Come up with as many activities as you can think of. Everything that comes to mind, write it down. I typed it. I took all the ideas I’d seen in magazines, things that Little Monkey likes to do, and ideas I’d been pinning on Pinterest and made a list of them all in Word. 2) Then, I printed the list. 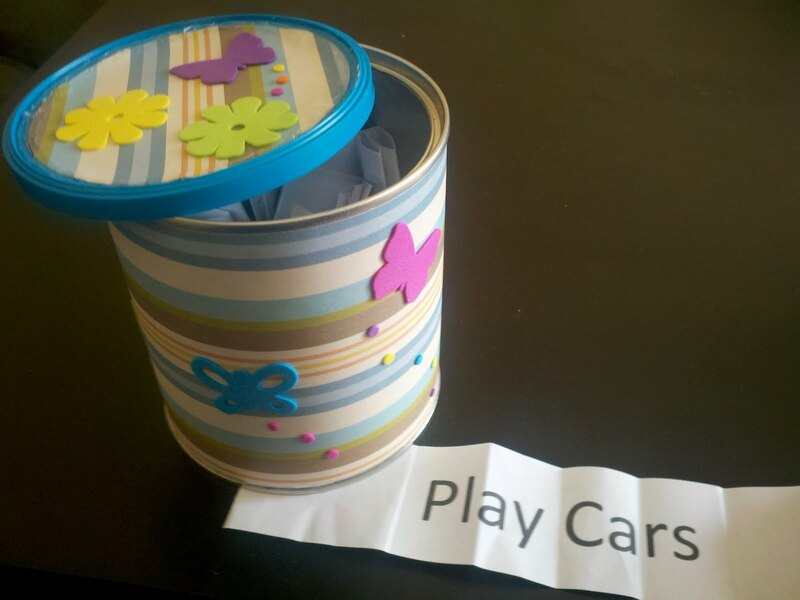 Cut the different activities apart and folded them up. 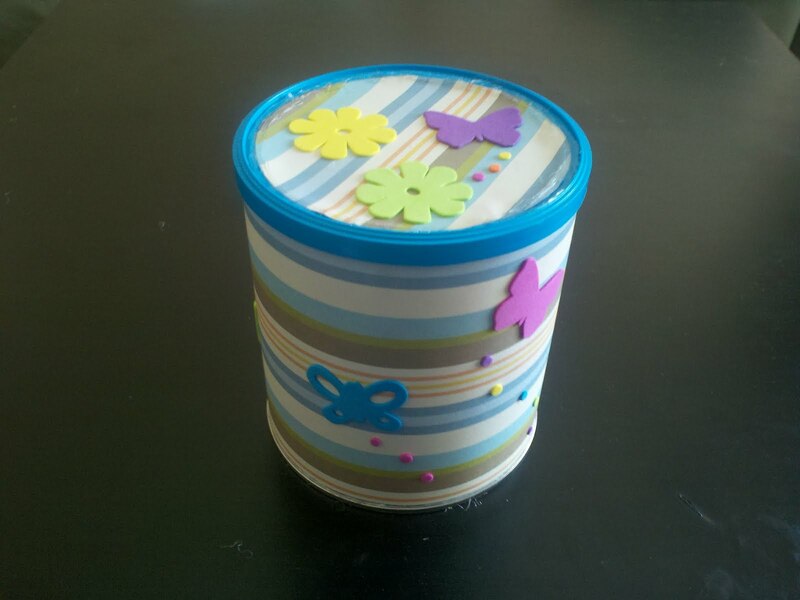 3) Then, they went in an old Similac can that I covered with scrapbook paper. Little Monkey got to help put the foam stickers on after nap time. That’s it. Easy as 1-2-3, but seriously, it’s a three step deal. So, now when Little Monkey starts to whine, and I catch myself reaching for the remote, I grab the Boredom Buster Can instead. Little Monkey loves to pick the papers. In fact, that should have been one of the activities in the can, he could do that for a good half hour. Little Monkey can’t do any of the activities on his own (which is good, I need to spend more educational time with him), but older kids absolutely could do the activities on their own. When those dreaded “Mom, I’m borrreedd-ah” whines hit your hear, send them to the can… The Boredom Buster Can. At this point, mostly it just gives me ideas without causing any kind of migraine. Great idea! I would love it if you would link up to my Tuesday Confessional link party going on now: http://www.craftyconfessions.com/2011/07/tuesday-confessional-link-up-2.html. I hope to see you soon! What a great idea! I have the same problem with my 2 yo! He wants to watch his movies, which are educational and teach good morals. But, I still don’t like how much time he spends in front of the television. I look forward to trying this out! Such a cute idea! Can’t wait ’til I can do this with my little guy.